Splash! There I dove into the waves of the mind-boggling clear water, coloured blue by the blue sky above me, and I beat all the waves one by one until it got me tired and I gave up, ending up on the beach, gasping for air. The sun was burning on me pretty well and I guess I should have used some sunscreen before going here. But it was good. It was paradisaical. Magical. It is called North Stradbroke Island. I said goodbye to Sam and Carmen and thanked them for helping me out with the last night. Tanya, the public relations lady of 97.3FM with a very overactive personality, picked me up at Sam�s house in Ascot at 7am. Again. As somebody from 97.3FM would bring me to the ferry in the coastal Brisbane suburb Victoria Point, I spent some time at the radio station again. I almost knew the names of most of the people and filled up their mugs with coffee. It was American trainee at the station, Jimmy, who took me along to Victoria Point, where my ferry would leave. During this drive we spoke about Americans and their new common fear of travelling. It�s a pity, but the rest of the world doesn�t seem to have any fear for terrorists. Maybe because it is the Rest Of The World. The Island Ferry Company had offered me a return ticket to the island on the radio. I boarded this small ferry with four other cars and planted myself on the passengers� deck. Pretty soon the two crew members (one for the navigation, one for telling jokes) discovered me, offering me a drink and immediately one started to tell jokes during the 45-minutes trip. We passed some beautiful little islands in the so-called Moreton Bay, which have white beaches and probably holiday homes ashore. The sun was shining, the water was blue and my thoughts were with transport. The ferry would touch land at the town called Dunwich and someway I had to find my way to Point Lookout, the town on the other side of the island. And North Stradbroke Island is not a small island. It is some 45 kilometres long and some 25 kilometres wide, however it gets narrower in the south. But with four cars on the ferry, maybe one would go to Point Lookout, one of the three towns on the island. And yes, I was lucky and I got on the island in the car of an Adelaide couple that were spending their holiday in Queensland. They took me all the way to Point Lookout where I was invited to spend two nights in the Stradbroke Island Hotel. And because every hotel, hostel or guesthouse as the name Stradbroke Island in their name, I was confused and I let my supporters drop me off at the wrong place. The actual Hotel I was staying at was only five minutes up the hill, the lady at the wrong place told me friendly. I walked up the hill, carrying my backpack and laptop and I soon figured out that five minutes, would mean five minutes by car. Who would ever walk distances on this island? I thought about hitching a ride, to make it some real five minutes. The person who drove a little van and decided to take me along, ended up to be David from the Dunwich Bakery. David had also contacted the radio station and offered me a meal from his bakery and a ride to my hosting place. But through some strange twist of fate his ride was not listed on the inventory that 97.3FM made for me. Anyway! �What a coincidence!� David said. I eventually got his ride after all. David got me to the right hotel and it was Lyn, the current caretaker of the hotel, who heard me on the radio and plugged her hotel on air. Inviting me was a good free publicity thing for the hotel, of course. I dropped my stuff in my hotel room on the first floor and got back downstairs. 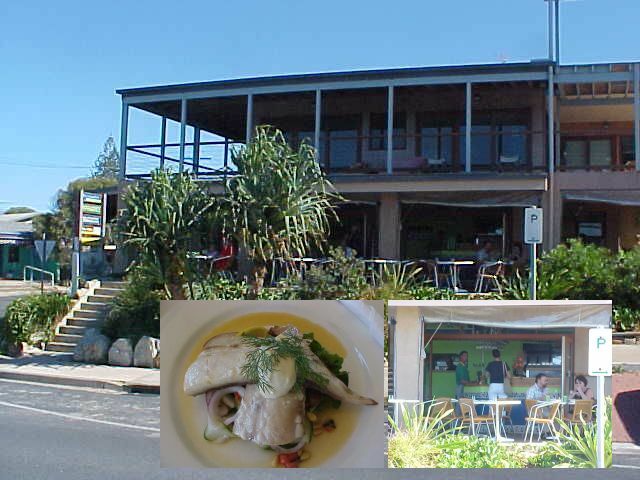 David said he would love to take me along for a small drive through diminutive Point Lookout and have a lunch at the local lunchroom, the Stonefish Cafe. David showed me the stretched white beaches at the north and the east part of the island. This island was beautiful! It just looked so unspoiled and pure!!!. We drove around and I enjoyed this place! Of course it has its spread of holiday homes and luxurious villas, together with some small necessary shops, which makes it all feel very comfy and homy. I met up with David�s wife Lou and their son and they treated me on a lunch. It was the first thing I ate today, because after this morning�s departure I only had a few drinks at the studio and on the ferry. And you know what? I ate dolphin fish! Well, it�s actually not of a dolphin itself, but its political incorrectly called like that as it is the favourite fish that dolphins eat. Got it? It took me a while. Together with David I went through the inventory the radio station had created. I was going to stay on this island until Monday morning and we had to make sure everything was well arranged, because there were some fascinated errors in the script from 97.3FM. It had a list of accommodations and a list of places to eat, like restaurants and clubs. But it also said some day: �Tonight you�ll eat out with the locals. We don�t know where� which sounded all very amusing, but wasn�t really helping me out. This delivered me some comfort, as David was a person that didn�t want me to be hungry while I was on the island and he would help me out when necessary. Splash! There I dove into the waves of the mind-boggling clear water, coloured blue by the blue sky above me, and I beat all the waves one by one until it got me tired and I gave up, ending up on the beach, gasping for air. The sun was burning on me pretty well and I guess I should have used some sunscreen before going here. But it was good. It was paradisaical. Magical. I had a shower at the hotel and a little nap and was back alive again when the sun was setting. The hotel room had a phone line I was allowed to use to connect my laptop with, a small television and a little fridge. While receiving my emails with my laptop on my lap while sitting on my balcony, I looked out and enjoyed my views of the hotel�s backyard: palm trees, the beach and an endless space of water. This is weird! Boing, you've got mail. By 6.30pm it was time to get going to the local Bowls Club down the hill, where the manager Brian Gee had invited me to have a few meals. Somehow bowls is a sport in Australia, where people roll balls to another ball, definitely no bowling as I noticed on the fields outside. Inside the Bowls Club I was served roasted beef with veggies and chips and Brian gave me a beer and introduced me to some locals. I met up with the one and only journalist on the island, Margaret, who loved to do a report on me soon and even met Joanne, who owns a restaurant in town where I definitely had to eat tomorrow. And after dinner and a few beers later, I met up with some young folks. I asked them what they do on the island. Not much, they explained me. The island has some 3,000 permanent residents and during public holidays the island is suddenly packed with 30,000 people. There is no actual nightlife, next to the bowls club and the pub at my hotel. �We could use a nightclub,� one of the guys suggested and they stared out of the window. I had enough beers and wanted to do some of my work done in my room, so I headed back to my hotel. But manager Brian had arranged that Barry Logan would drive me that little bit back to my hotel. The fact that Barry doesn�t only drive the Courtesy Bus of the Bowls Club, but also organizes the Tour de Straddie in his 4WD-truck of his own company Beach Island Tours, which was a simple reason for him to offer me a free ride on his tour tomorrow morning! Probably also because he had heard of what I am doing on this island and any bit of publicity is good for the entire island. Back in my room I did some writing and enjoyed the sound of the beach through the open door. The fan on the ceiling was on full speed, however it was dark and almost midnight, I was still sweating. Anyway I knew I would sleep perfect in the king-size bed.